A patient had a long-standing history of coronary artery disease, suffering his first myocardial infarction (MI) at age 47. He had recurrent chest pain a year later and underwent a work up to rule out MI. He was treated medically without invasive procedures. 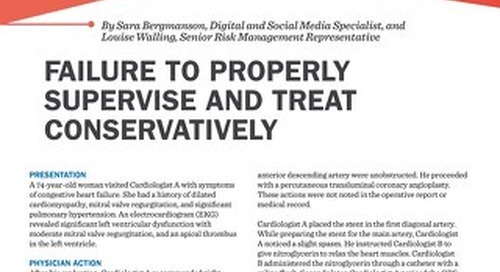 Four years after the first MI, he came to a new cardiologist, the defendant in this case. A cardiac catheterization showed 99% proximal right coronary artery disease with a 90% circumflex lesion, a 70% diagonal branch and total occlusion of the left anterior descending coronary artery. His ejection fraction was less than 20%, and he had unstable angina. The patient underwent right and left heart catheterization, coronary arteriography, and percutaneous translumenal coronary angioplasty. Nine months later, the patient returned to the cardiologist for repeat cardiac catheterization. This catheterization showed a totally occluded left anterior descending coronary artery, no advancement in the 40% to 50% narrowing of the circumflex, some evidence of re-stenosis in the proximal one-third of the very large coronary artery which was diffusely diseased, and a 50% to 70% lesion at the site of the previous angioplasty. He was discharged without further procedures under medical therapy. The patient returned to the cardiologist two years later for a repeat cardiac catheterization. The LAD remained totally occluded, the circumflex was a small vessel and it was not possible to do an angioplasty on that vessel. 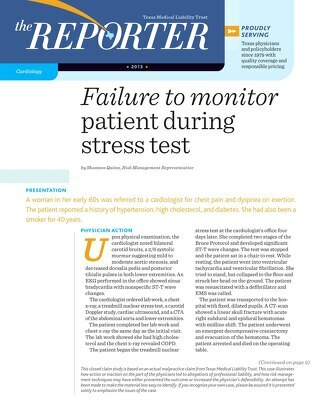 The patient was again seen by the cardiologist seven years later and the cardiologist reported the patient was doing quite well with occasional shortness of breath upon exertion. He was on medical therapy and was without any significant changes in his clinical status except a reported presence of a Grade I mitral regurgitation murmur. 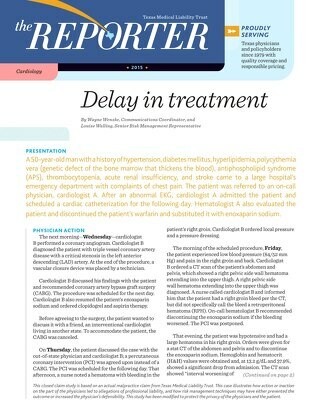 Approximately two months after his last appointment with the cardiologist, the 61-year-old patient came to a local emergency department (ED) complaining of chest pain, burning in his left chest and epigastric area, and shortness of breath. He was transferred via air ambulance to an urban hospital and to the care of his cardiologist. The EKG showed premature ventricular complexes, left atrial enlargement, septal infarction of indeterminate age, marked ST abnormality, and possible inferior subendocardial injury. 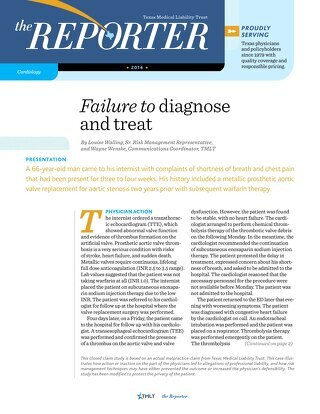 The patient was seen in consultation by a gastroenterologist who performed an esophagogastroduodenoscopy that revealed focal erythema, edema and small raised dots of reddened mucosa involving the antrum. He diagnosed mild gastritis. The cardiologist performed an echocardiogram showing severe mitral insufficiency, biatrial enlargement, calculated right ventricular systolic pressure of 43 mm Hg, and left ventricular dysfunction with an ejection fraction of 26%. An EKG performed the following day was interpreted as showing left atrial enlargement, septal infarction and marked ST abnormality, and possible inferior subendocardial injury. The patient had a fever of just above 100 degrees every day during his 3-day admission, including the day of discharge. According to the cardiologist, but not documented in the patient's medical record, the patient declined cardiac catheterization and wanted to be discharged home. He was to return to the gastroenterologist in five days and the cardiologist in approximately three weeks. The day after his discharge, the patient suffered an MI and died. failure to properly order other diagnostic studies. The plaintiffs alleged that the patient should have undergone cardiac catheterization and that failure to treat was negligent and resulted in the patient's death. Negligence is the failure to use ordinary care, that is, failure to do that which a health care provider of ordinary prudence would or would not have done under the same or similar circumstances. One of the main issues in this case was documentation. Essentially the case became a debate regarding a conversation with the cardiologist and the patient about whether cardiac catheterization was offered and refused. The physician admitted at deposition that he made a mistake in not documenting the patient's refusal to have a catheterization. However, he was adamant that he did discuss the matter with the patient and the patient refused the procedure. The plaintiff's attorney found expert opinion to support the allegations, claiming the patient's death could have been prevented with appropriate diagnostic tests and revascularization. Had the disease been too extensive, bypass surgery might have been appropriate. Defense experts believed the patient was not a surgical candidate. 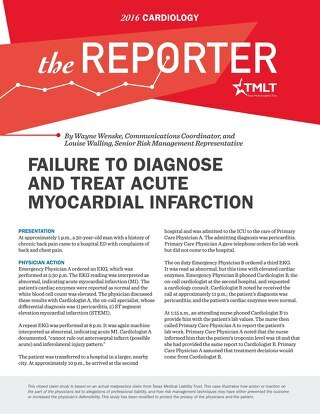 They were supportive of the cardiologist's decision not to perform a cardiac catheterization in accordance with the patient's wishes. It was entirely within the standard of care for a physician not to push extreme measures when there was little expectation of success. Further it was reasonable for a patient in such poor health to refuse additional intervention. This case was taken to trial with the plaintiffs requesting an award totaling $2.1 million. The verdict was returned in favor of the plaintiffs, the patient's four adult children. The jury found the physician negligent and awarded damages of approximately $50,000 for funeral costs, medical expenses, and past mental anguish. Texas law recognizes that physicians must obtain consent for treatment and that such consent be "informed." A variant of informed consent is informed refusal, in which a patient refuses treatment after having been informed of the risks and benefits of the intervention. Many physicians associate the concept of informed refusal with the patient who leaves the ED abruptly or discharges himself from the hospital. However, as the case study illustrated, a patient's refusal to consent to a recommended intervention can occur under a variety of circumstances, and can lead to lawsuits involving allegations of failure to treat or failure to inform. "Implicit in and intrinsic to the concept of consent for treatment is the option of refusal. In Cruzan v Director, Missouri Department of Health, the U.S. Supreme Court ruled that all U.S. citizens have a constitutional right to refuse unwanted therapy, a right residing in the due process clause of the 14th amendment. All patients have the right, after full disclosure, to refuse medical treatment. This can include patients who decline medication, routinely miss office visits, defer diagnostic testing, or refuse hospitalization. Physicians are then prohibited from proceeding with the intervention. 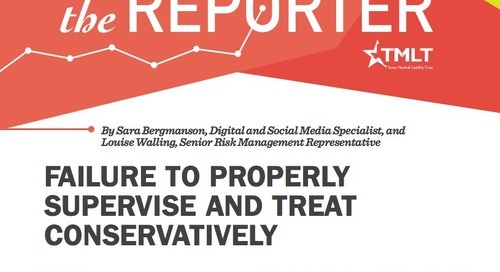 "Problems arise, however, when the patient or the patient's family later argue that they were not given enough information to make an informed decision, or that the patient lacked the capacity to make the decision," says Jane Holeman, vice president of risk management at TMLT. As is frequently emphasized in the medical risk management literature, informed refusal is a process, not a signed document. "Physicians need to show that the patient's decision to decline treatment was based on a full understanding of all the facts necessary to make that decision," says Holeman. "Physicians cannot force a treatment on a patient, all they can do is educate." Circumstances in which informed refusal should be obtained vary considerably. Such situations can include "everyday" occurrences such as when a patient refuses to take blood pressure medication or declines a screening colonoscopy. It can also involve the patient who refuses life-saving surgery. "Physicians need to evaluate each situation to determine the consequences of the patient declining the intervention. From there, determine what needs to be discussed with the patient," says Holeman. When faced with an ambivalent or resistant patient, it is important for the physician to use clear and unambiguous language to avoid misinterpretation. "Sometimes the only way to get a patient's attention is for the physician to very bluntly tell the patient 'if you do not have this surgery, you will likely die,'" says Holeman. According to Holeman, understanding why a patient refused an intervention is important because the decision could be irrational or based on misinformation. "An extreme example is a patient with an elevated PSA who refuses a prostate biopsy because he is afraid it would make him sterile. It would be important to address this concern in the discussion because you may be able to overcome it and obtain consent," says Holeman. With regard to obtaining consent for medical interventions, competence and decision-making capacity are often confused. (5) A patient's competence or incompetence is a legal designation determined by a judge. Decision-making capacity is clinically determined by physician assessment. Does the patient understand all the information about the intervention? Does the patient appreciate how that information applies to his or her situation? Can the patient evaluate the information, comparing risks and benefits? In the article "Ten myths about decision-making capacity," the authors address the misconception that only mental health experts can assess decision-making capacity. A number of tools for determining decision-making capacity exist. (4, 5, 6, 9) "Once a patient has been identified as requiring a more careful assessment of capacity, the evaluation should proceed in a clear and organized manner." (9) Additionally, physicians should clearly document the assessment and final judgment about capacity in the medical record. Prudent practice involves comprehensive documentation. As with the informed consent process, informed refusal should be documented in the medical record. In the case study, the jury found in favor of the plaintiffs when faced with a deceased patient and an undocumented patient decision of great importance. 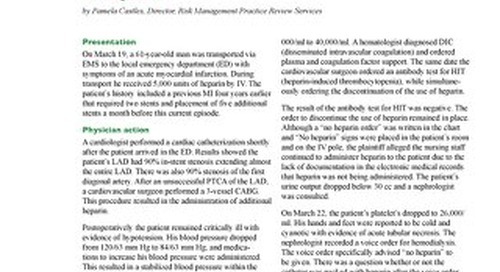 A signed refusal for heart catheterization — including the risks, benefits and options, with the patient's signature witnessed — may have prevented this claim. "All cases of informed refusal should be thoroughly documented in the patient's medical record. Also, families watching the clinical demise of their loved one due to therapy refusal may demand inappropriate care, and even threaten to sue if such care is not provided, thus the heightened importance of thorough documentation. 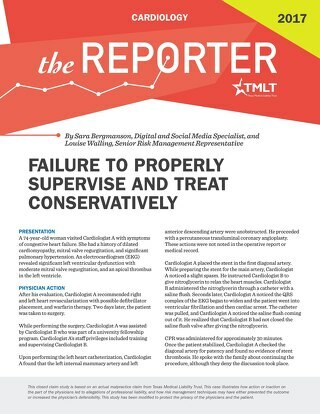 Holeman says that many physicians may feel it is not necessary to document the more common instances of informed refusal, such as when a patient refuses to take medication or defers a screening test. "Physicians need to protect themselves in these situations. 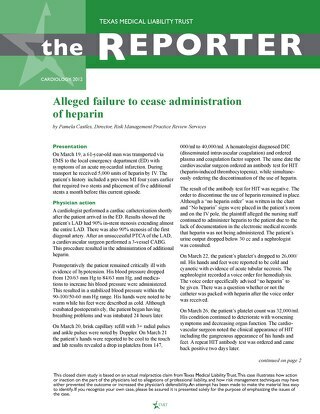 If the patient suffers a bad outcome, he may come back and say he never understood why he needed to take the medication or have a test done," says Holeman. "At a minimum the physician should have a note in the chart that says 'patient declined screening mammogram after a discussion of the risks/benefits.'" Physicians can further protect themselves by having the patient sign the note. If the patient's refusal could lead to severe or permanent impairment or injury or death, an informed refusal form can be used. (Please see sample informed refusal form) Some physicians streamline this procedure by selecting the interventions most commonly employed in their practices and developing informed consent and informed refusal forms that cover these treatments. Taking this step may also help reinforce the seriousness of the situation for the indecisive patient. In addition to documenting the informed refusal discussion, the following recommendations may help minimize the risk of lawsuits related to patient refusals. Use any community resources available. "Our advice is to use bioethics, social work and psychiatry services early in the process of therapy refusal, especially when the consequences of such refusal are severe, irreversible morbidity or death." (10) Having the patient obtain a second opinion may be effective, as hearing the same concerns strongly voiced by two physicians may convince the patient to proceed. "Finally, the physician must be aware that the ethical obligation to do what is in the patient's best interest is not terminated by the patient's refusal to follow the physician's best advice." (2) If the patient persists in the refusal, it is important for the physician to leave the door open for the patient to return. Instruct the patient about symptoms or signs that would prompt a return. Provide an appropriate referral and detailed discharge or follow-up instructions. In addition to documenting the patient's refusal at the time it is given, document the refusal again if the patient returns. "This may apply more to primary care physicians who see the patient routinely. It may be necessary to address the intervention that the patient refused at each subsequent visit," says Holeman. Document this discussion in the medical record, "again discussed with patient the need for cholesterol-lowering drugs . . . patient declined." Bernat J, Peterson L. Patient-centered informed consent in surgical practice. Arch Surg. 2006 Jan;141(1):86-92. Solomon R. Ethical issues in medical malpractice. Emerg Med Clin N Am. 2006 Aug;24(3): 733-747. Engel KG, Cranston R. When the physician's medical judgment is rejected. Clinical case 2. American Medical Association Virtual Mentor Archives. February 2004. Available at www.ama-assn.org/pub/category/11846.html. Accessed April 12, 2007. Ganzini L, Volicer L, Nelson W, Fox E, Derse A. Ten myths about decision-making capacity. J Am Med Dir Assoc. 2005 May-June;6(3 Suppl):S100-104. Jones R, Holden T. A guide to assessing decision-making capacity. Clev Clin J Med. 2004 Dec; 71(12):971-975. Derse AR. What part of "no" don't you understand? Patient refusal of recommended treatment in the emergency department. Mt Sinai J Med. 2005 July;72(4):221-227. Marco CA. Does patient autonomy outweigh duty to treat? Clinical case 1. American Medical Association Virtual Mentor Archives. February 2003. 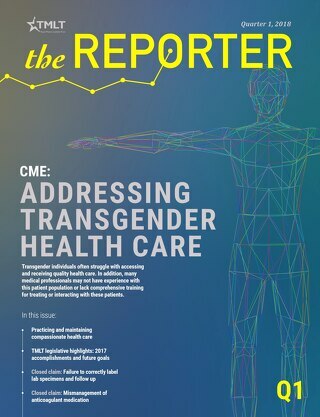 Available at www.ama-assn.org/ama/pub/category9575.html. Assessed April 12, 2007. Bramstedt KA, Arroliga AC. On the dilemma of enigmatic refusal of life-saving therapy. Chest. 2004;126(2):630-633. Tunzi M. Can the patient decide? Evaluating patient capacity in practice. Am Fam Physician. 2001 Jul;64(2):299-306. Bramstedt K, Nash P. When death is the outcome of informed refusal: dilemma of rejecting ventricular assist device therapy. J Heart Lung Transplant. 2005 Feb;24(2): 229-230.  Evans GF, Meyer MA, Texas Medical Liability Trust. Informed consent: the third generation. February 2004. American College of Obstetricians and Gynecologists Committee on Professional Liability. ACOG Committee Opinion No. 306. Informed refusal. Obstet Gynecol. 2004 Dec; 104(6):1465-1466. Wagner RF, Torres A, Proper S. Informed consent and informed refusal. Dematol Surg. 1995 Jun;21(6):555-559.